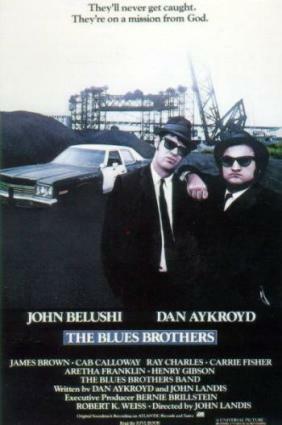 John Belushi and Dan Aykroyd are Jake and Elwood Blues, better known as The Blues Brothers, in this 1980 comedy classic set in the city of Chicago, and featuring some of the best-known performers in contemporary music. On the day that Jake is released from prison, Elwood picks him up outside Joliet Federal Penitentiary and takes him to keep his promise to visit the Penguin. Jake is not pleased, but Elwood insists. The Penguin is a nun, a very strict disciplinarian who raised the orphaned Jake and Elwood in St. Helen's Orphanage. She still exerts considerable power over "the boys." The Penguin tells Jake and Elwood that the city has assessed a property tax of $5000 on the orphanage and they can't afford to pay it. If the tax isn't paid in eleven days, the orphanage will be sold to the Board of Education. She needs their help to get the money, but she doesn't trust Jake and Elwood to get the money honestly. When the boys start cursing, she whacks them out of her office. At the bottom of the stairs, they meet Curtis (Cab Calloway), who encourages them to help. He sends them to church, where the Reverend Cleophas's (James Brown) preaching inspires Jake with a solution for getting the money for the Penguin honestly. Before Jake was sent to Joliet, he and Elwood headlined a rhythm and blues band called The Blues Brothers, and Jake believes that if they reunite the band and perform, they can easily earn the money that they need to save the orphanage. But there's a large problem: the band is scattered all over the Chicago metropolitan area, and not all of them are keen on leaving their steady jobs for an iffy lot of gigs with their old band. Steve "The Colonel" Cropper, Tom "Bones" Malone, Willie "Too Big" Hall, and Donald "Duck" Dunn have joined up with Murph (Murphy Dunne) to play pop music in a local hotel bar. Matt "Guitar" Murphy and "Blue Lou" Marini have opened a soul food restaurant with Matt's wife (Aretha Franklin). And Mr. Fabulous (Alan Rubin) is the head maitre d'hotel at Chez Paul, one of the fanciest restaurants in Chicago. In one way or another, including some really obnoxious (and hilarious) restaurant hijinks, Jake and Elwood manage to convince everyone to re-form The Blues Brothers and go on the road. They get their instruments, amps, and mikes from Ray (Ray Charles), and they are set to perform. All they need is a venue. And they get one ... but the unfolding of how they get their gig and make the money to save the orphanage ought not be spoiled. In the course of reuniting the band, Jake and Elwood have managed to infuriate a great number of people, all of whom are out for blood. A couple of state troopers, a group of Neo-Nazis, a country and western band (whose gig they steal) and ... a girl! Whoever she is, this Mystery Woman (Carrie Fisher) is definitely out to kill. She blows up the flophouse where Elwood lives, she uses a flamethrower to blow up a phone booth the boys are in, and she finally confronts them face-to-face with a machine gun. The Blues Brothers held the world's record for number of cars crashed, and contains two of the best chase scenes ever. In the first, Jake and Elwood run amok in a shopping mall while being chased by the sheriff's deputies. Glass, kiosks, store displays are flying everywhere as the cars demolish the interior of the mall. The scene was filmed in a real mall that had been empty for a year, and that was re-populated through sponsorships. The second chase scene includes everyone whom Jake and Elwood have ever angered, chasing them through downtown Chicago as they try to reach the tax assessor's office before the deadline. The Nazis, the country-western band, and just about every law enforcement officer in Cook County follow Jake and Elwood into Daley Center, wreaking havoc as they go. At one point in this chase, the Blues Brothers are driving over 100 mph down Wacker Drive in downtown Chicago -- this stunt was real; permission was received from the city for two takes of this scene. The Blues Brothers is replete with cameos by dozens of celebrities -- and not just the ones you'd expect. Look for Henry Gibson, Twiggy, Frank Oz, Chaka Khan, John Candy, and Steven Spielberg, among others. 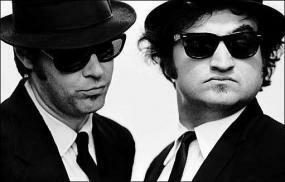 The Blues Brothers pulls together some of the greatest music talent of the age. Besides featuring Ray Charles, Aretha Franklin, James Brown, and Cab Calloway, the film includes music by Isaac Hayes, Billy Joel, Henry Mancini, Hank Williams, Tammy Wynette, and even Richard Wagner ("Ride of the Valkyries"). This film is rated R for a reason. There's a great deal of obscenity and profanity, both spoken and gestured. The scenes with the Neo-Nazis and some of the stereotypes portrayed in various scenes may be offensive.